We walked no more that 20 feet and busted a covey of quail. What a start! 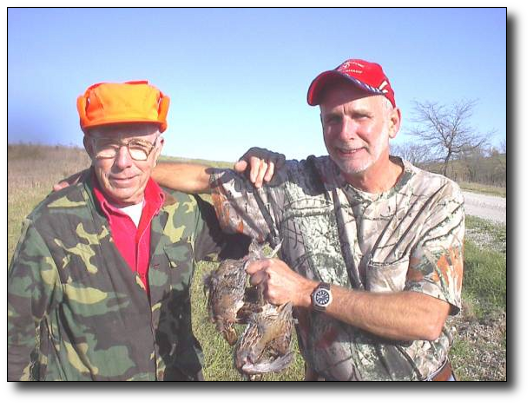 This was November 1, 2007, the Missouri upland game opening day. Unfortunately almost turned out to be the highlight of the day! 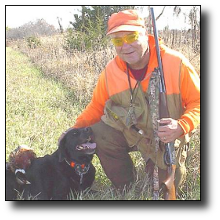 All the pre-opening day research I compiled indicated the bird numbers were going to be 50% or more below last years figures. However, we didn't expect the hunting to be so difficult. The above picture includes members Tom and Warren. 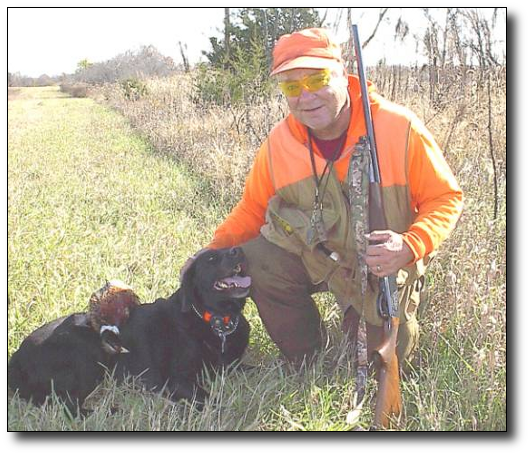 Warren is holding four quail, our total for day one! The cover was very good on our reserved property. Actually too good! Standing corn across the road and standing beans on one section we hunted. We saw only one rooster and he managed to elude us. Northwest Missouri should be better later in the season when the crops are harvested and a little snow on the ground would help. By day two our group had dwindled to 2, Warren and me. Yesterday my black lab Fay had pulled a shoulder muscle and I expected she would not make the trip for day 2. A couple aspirins and by morning her limp was not noticeable. She begged and begged to go. I knew it was going to be breezy and slightly cooler so it she had to stay in the car, she wouldn't get overheated. To my surprise, she lasted the half-day we planned to hunt. "Planned?" That word is not indicative of the situation. "Our leg muscles" were the mitigating factor. There was so much good cover to work, our minds were willing, but our bodies were weak! To our surprise we saw no quail this second day. The cover was perfect, the weather a bit warm and breezy, but where we were, they weren't! We did manage to scratch one rooster down. Saw a couple other roosters and a hen, sailing over the far field! Opening day is special. I just have to go. I wait all year for this opener and each one holds something special in my memory bank! This area will get better. Picking the right time will be the key!